Hilldrup’s Culture Crew plans fun activities each month, led by various departments. This month, Accounting/Billing created the fun event through the inspiration and planning of Mary Kay Young, Sr. National Account Audit Bill & Revenue Analyst, and Toni Mohrman, Bill/Order Processor. All Stafford employees were encouraged to work alongside their fellow coworkers to solve a mystery challenge in record time! Participants were provided a token the day before the challenge with instructions on the time and location at which to meet, along with a buff to wear. We were thrilled to have over 40 employees participate in what will be an event that is going to be talked about for years to come! One person from each team was the leader for their group. The leader faced their team members whoeach stood shoulder-to-shoulder in a line. The five team members put on their blindfolds (thanks to their buff!) and on the count of three turned around and blindly located one of the five boxes within the room. The leader needed to communicate and channel his or her agility to ensure that everyone found a box quickly! Once everyone had a box, the team members could take off their blindfold to begin working on the real challenge! 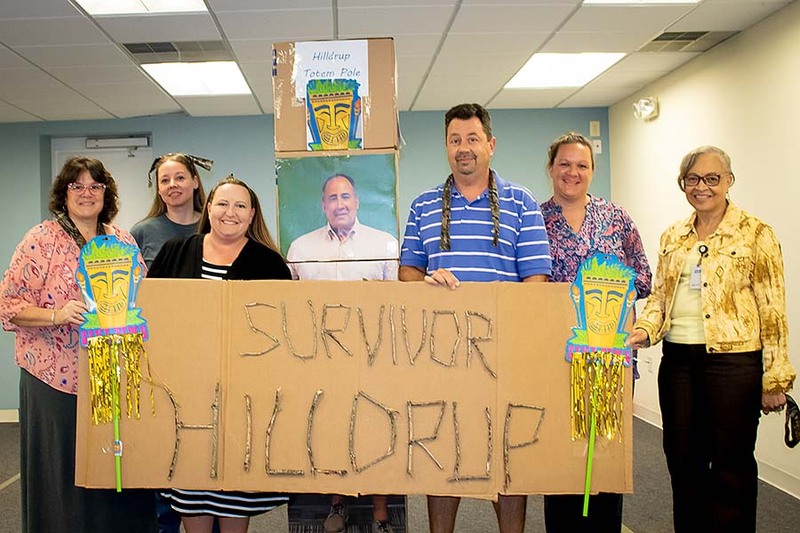 The team, with help from their leader and each other, needed to arrange the boxes, that had photos on all sides, to piece together the puzzle of the person that they were “creating.” Together, the boxes would form a “totem pole” of that Hilldrup leader. Teams could organize the boxes to complete a photo of Charles W. McDaniel, Charles G. McDaniel, Russ Watson and Barry Dodson. The team to accomplish all of this in the least amount of time was declared the winner! The winning team completed the Tribal Mystery Challenge in an impressive minute and 37 seconds! Congratulations to our winners: Michele House, Director International Operations; Carmen Garrett, Claims Coordinator; Kolby Yothers, Billing & Revenue Analyst; George Roth, VP Customer Service; Rebecca Taylor, Manager Customer Service, and Sheila Jackson, Imaging Clerk. Each winner received a tribal “medal” necklace and gift certificate. Thank you to all of our participants who accepted the Mystery Tribal Challenge and to Mary Kay and Toni for their creativity and hard work putting this event together! At Hilldrup, we take pride in our tribe! Congratulations to our winners (from left): Michele House, Carmen Garrett, Kolby Yothers, “Charles W. McDaniel,” George Roth, Rebecca Taylor and Sheila Jackson. Great teamwork everyone!